About a year ago, I took a look at the notion that firearm sales had gone down during President Trump’s term. The reality? Gun sales had, in fact, not gone down, and the average NICS checks per month during his time in office had already overrun President Obama’s numbers by about a third. Well, here we are about a year later, with a year’s more data; are firearm sales down yet? NICS checks are not a track of the total firearm sales in America, for two very significant reasons. Any number of firearms could be transferred on a single NICS checks. It could be 1. It could be 10. Some states, such as North Carolina, use their carry permit system as a replacement for the NICS background check. You still have to fill out an ATF Form 4473, but no NICS is run on you. At best, NICS checks can be considered a “floor” for the data, as in “no fewer than this many new firearms entered circulation in America on these months/years”. 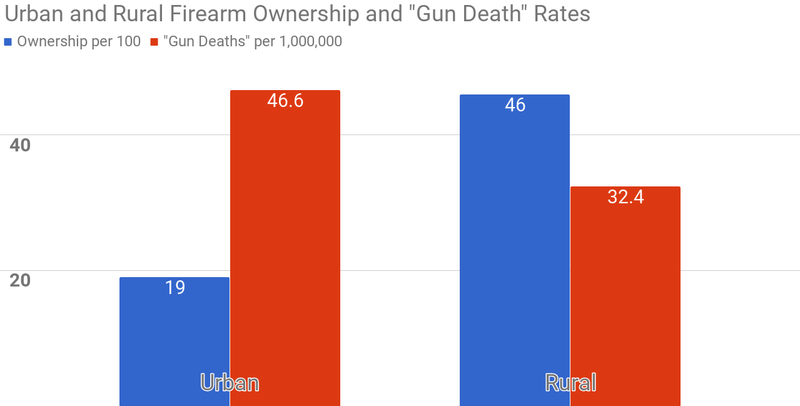 But, still, as I said last year, NICS checks are regarded as the primary metric by both the pro-rights organization and the “gun control” extremists, so it is still a good – if incomplete – measure of overall trends. 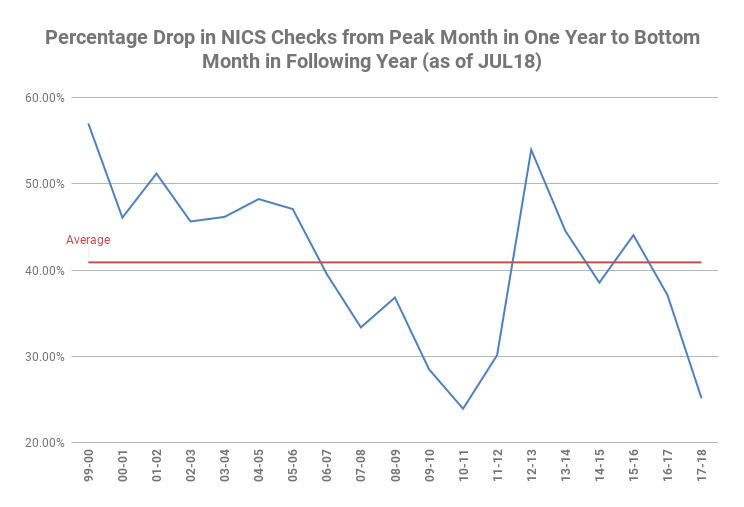 Now, in fairness, that metric could indicate that NICS checks are constantly trending upwards, on average, or it could indicate that firearm sales are simply leveling off. So, now that we have another year of data from President Trump’s time in office, let us consider the options. How about if we look at sales in the equivalent months of each President’s term? In other words, let us compare the first month of Trump’s term against the first month of Obama’s term, and the first month of Obama’s term against the first month of Bush’s term, and so forth. Which month had higher NICS checks? I would put a pretty graphic here, but the honest truth is that there is a grand total of one month – December of 2007 – where the NICS checks were lower than its corresponding month for a previous President (in this case, December of 1999). 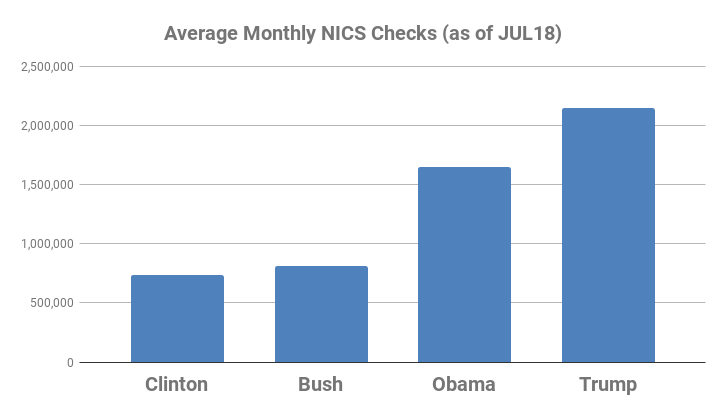 In other words, since December of 2006, NICS checks have been higher in a given sequential month of the current President’s term when compared to the equivalent sequential month of the previous President’s term 99.28% of the time. Alright, TL;DR time: no, gun sales are not down under President Trump. Their meteoric increase during the last President’s term appears to have slowed, but that may be nothing more than the establishment of a new normal. There are a lot of firearms in peaceful Americans’ hands, and they are not going anywhere. Author JonathanPosted on July 23 2018 July 23 2018 Categories dataTags background check, fbi, federal bureau of investigation, firearm, firearm owners, firearm sales, gun control, national instant criminal background check system, nics, nics check, president bush, president clinton, president obama, president trump, sales1 Comment on are gun sales down under president trump yet? are gun sales down under president trump? One of the favorite tactics of the “gun control” extremists for the past eight years or so is to decry pro-rights activists as “racists”, and use the massive uptick of firearm sales during and immediately prior to Obama’s administration as “proof”. I cannot say as though I understand that rationale myself, especially since both then-Senator and then-President Obama are on record as wanting to ban semi-automatic firearms, ban handguns, ban firearms based on aesthetic features, ban lawful carry of firearms, and so forth – you know, the kinds of things that would prompt people to purchase something before it became unavailable – but the “gun control” movement has never been big on logic. In any case, now that Obama is no longer in office, the “gun control” extremists are using the supposedly decreased firearm sales as further “proof” of the “racist” nature of the pro-rights advocates, as well as “proof” that firearm owners are a “dying breed”, and on, and on, and on. But are gun sales actually down? These statistics represent the number of firearm background checks initiated through the NICS. 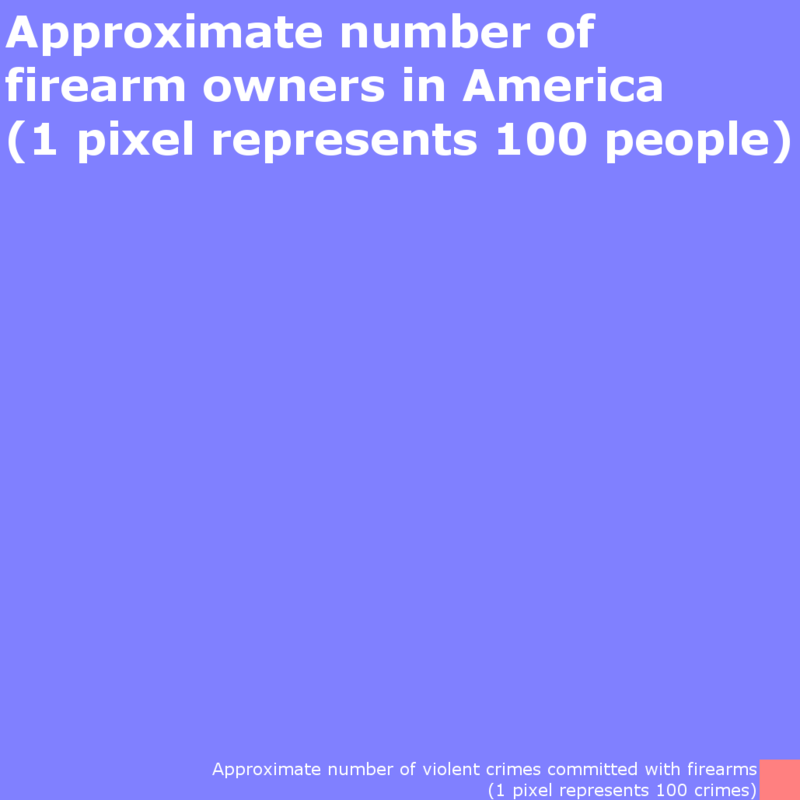 They do not represent the number of firearms sold. Based on varying state laws and purchase scenarios, a one-to-one correlation cannot be made between a firearm background check and a firearm sale. For example, in North Carolina, if one has a Concealed Handgun Permit in good standing, a purchaser still has to fill out a Form 4473, but no NICS check must be performed. Likewise, there is no limit to the number of firearms that can be purchased on a single NICS check, so one check can be one firearm, or one check can be a hundred. All that said, most parties – both in the “gun control” camp and in the pro-rights camp – consider NICS checks to be at least an indicator of how the firearm sales market is doing. Just bear in mind that it is not an accounting of actual sales, and does not even provide an actual floor for the numbers. Second, how do you quantify “down”? But that is not a strictly fair comparison, since he has only had four months in office, while Obama had 96 (for the sake of simplicity, despite United States Presidents being inaugurated on the 20th of January, I am counting their time in office from the first of February to the 31st of January, since the data is provided on a by-month basis). So what about the actual number of NICS checks per month? So a few things stand out on this chart. On the one hand, firearms are apparently a very popular Christmas gift, and the NICS checks reflect this seasonal nature. 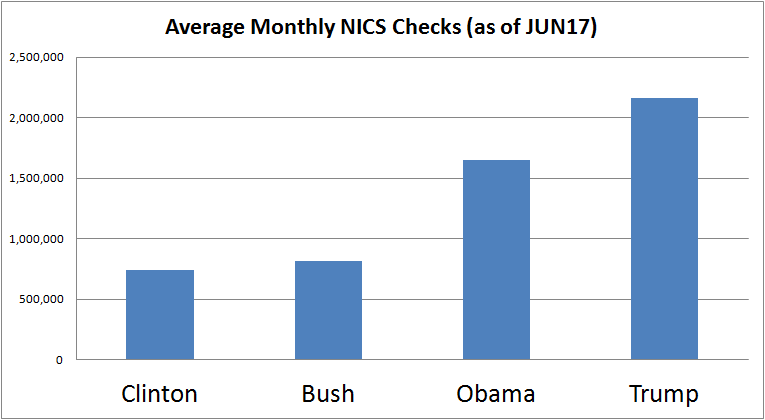 On the other hand, there has been an almost steady increase in NICS checks since 2002 – seven years before Obama took office. 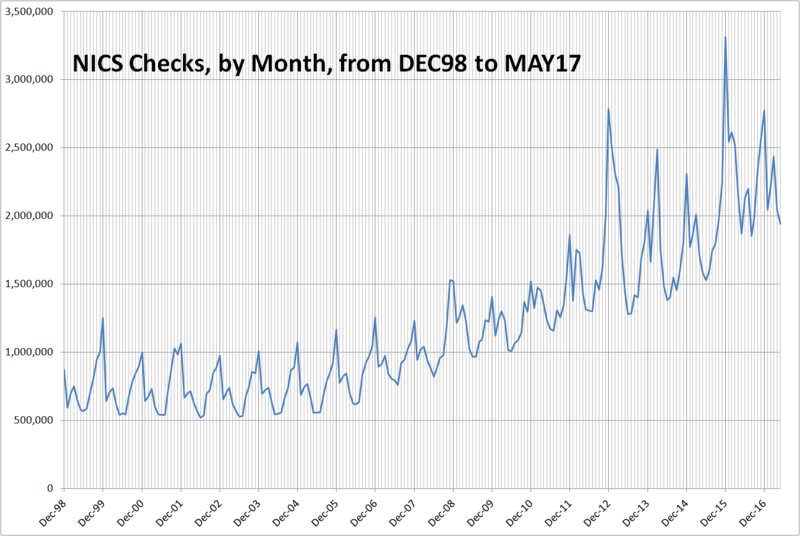 On the gripping hand, yes, NICS checks did peak out at 3,314,594 in December of 2015, and, likewise, are now at 1,942,677 in May of 2017. The problem with simply calling out those two months, however, is that it is blatant cherry-picking. It is true that the peak checks in Obama’s presidency is higher than the lowest checks in President Trump’s time in office, but that does not even come close to telling us if the total checks are down under the new President. Likewise, note that this past May – likely either the low month for this year, or close to it – still had more checks than any May before it. The fact is, firearm sales have been massively trending upwards for the past 14 years. Given that the trend started well before an African-American President, and given that the President in question was adamantly and openly anti-rights, the allegations of “racism” are about as valid as trying to claim that firearm sales are “down” based on all of four months of data. That is to say, not at all valid. Author JonathanPosted on July 1 2017 March 8 2018 Categories dataTags assault weapon ban, cherry-picking, fbi, federal assault weapons ban, federal firearm licensees, ffl, firearm owners, firearm sales, form 4473, gun control, gun control extremist, national instant criminal background check system, nics, nics check, president bush, president clinton, president obama, president trump, racism, seasonal trends, trend, upwards1 Comment on are gun sales down under president trump?